One indication of a neighborhood’s desirability is an abundance of ‘teardown’ projects–homes torn down to make room for a new property built on the same site. Mission Hills and Old Leawood residents see this happen often because buyers covet those particular areas –not too far from city amenities, good schools, tree-lined streets. Driving around Brookside, I have noticed four new homes going up on lots–an excellent indication of our neighborhood’s strength as a sought-after area to live. One of the most visible sites is at the northwest corner of Oak and 63rd St, across the street from the 7-Eleven. Bill and Stephanie Kalahurka bought this lot a couple of years ago. 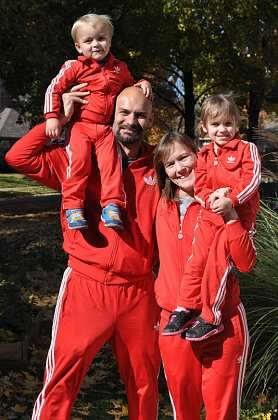 While living in Austin, they decided to move to Kansas City to be closer to family. Recently the couple secured jobs in the area and moved to a rental in Waldo while their new house is being built. I asked Stephanie why they chose to build instead of purchasing a resale property. They wanted to live in Brookside to be near Bill’s parents, and wanted this move to be into their ‘forever’ house. When Bill’s father mentioned the land was for sale, the couple decided this was their chance to build a home that would stay within the character of the neighborhood while having up to date mechanical features and materials. Stephanie and Bill are building a two story Craftsman style, just under 3000 SF, with four bedrooms, two and a half baths, a two car garage and a front porch that faces Oak. The most unusual feature is an indoor side for their two children, ages 2 and 3. If all goes as planned, the family will move in Memorial Day weekend. Another new build is going up at the corner of 62cd St and Brookside Boulevard. In October 2012, someone paid $130K cash for the old home on the large lot. The house is gone and you can see the foundation walls in place for the new house. At 429 E 71st Terrace in Rockhill Gardens, there’s just the first floor front shell of the old house on the lot. This property sold in October 2013 for $125K. The current owner purchased it for his mother. He is rebuilding the house and reusing the bricks, keeping the original stain glass windows in front and opening up the interior floor plan. It should be finished in March, and will blend in with the surrounding homes. Finally, the house at E 70th Terrace and Cherry is almost finished–that project was started earlier this year. It’s exciting to see these new single family homes going up in Brookside! You know if these owners are spending several thousand dollars on the lot, the teardown, plus the cost of a new home, they are committed to the neighborhood…and that should mean higher property values for all of us. This entry was posted in Brookside Community News and tagged brookside homes for sale, house at 63rd and Oak, lots in Brookside, Mary Hutchison, new homes in Brookside by Mary Hutchison. Bookmark the permalink.